vCPU, pCPU, lCPU, HT and You! Again, we will leave aside bus topologies for now as it is not germane. Once again we have a connection to the outside world, and we have multiple issues (in this case 4). Each issue is assigned to a separate processing core. So we have the ability to issue four instructions at once, to four different processing cores. Each of these cores has an independent pipeline. That is the key differentiator here. 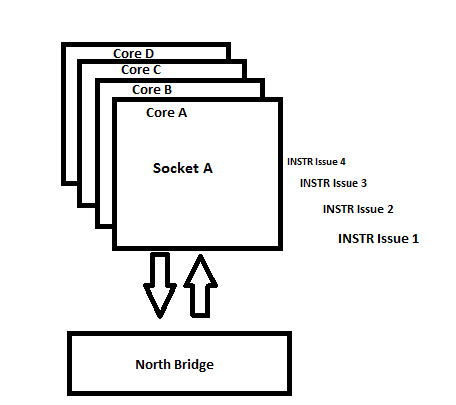 For a processing core to be considered “physical” in my opinion, it must have an independent pipeline. What that means it that you give “Core 1” an instruction, it can carry that instruction out to completion without worrying about “Core 2”. This is simplified, but you get the idea. Execute – the processor next executes the instruction. 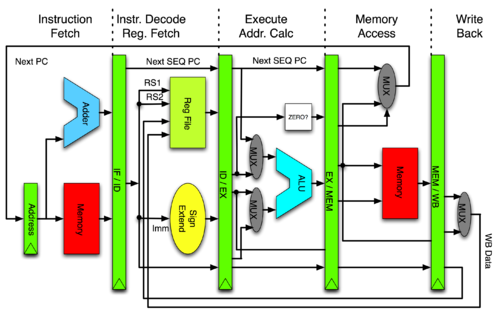 In modern “super scalar” processors, there are multiple “execution units”. Super scalar came from the RISC world where the simple instructions allowed for simpler execution units that could be “scaled out” allowing for two instructions to be executed at once. Typical “execution units” are “integer units” (which handle integer math) and “floating point units” which handle, shocker, floating point math. With the advent of super-scalar architecture, this is where pipelining started to get fancy and a single CPU could work some magic like executing two instructions at once. Essentially, before an instruction was “finished” another one would be grabbed (issued) to be executed at the same time. Lots of conditions had to be met (primarily, an execution unit had to be free). To make this process more efficient and less dangerous, facilities were build around it. Modern CPUs can execute out of order (take an instruction a few down rather than the next one) and cherry pick these instructions based on which instructions can be executed together via algorithms like “branch prediction”. The logic here is that if the outcome of instruction A might impact what instruction B does, then they cannot be executed at once. If instruction C or D might be next executed (after B) depending on the outcome of A and B, the processor logical will pick either C or D to execute in parallel with A based on “branch prediction”. If it is wrong, it wasted time and has to do a do-over. If it is right, it gained some big efficiency (100%). The above can be hard to digest, but there is a ton of reference out there on the web which covers it at whatever level of detail you need. 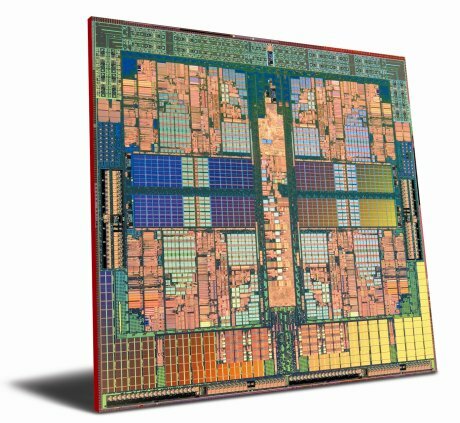 Everything from the physical signaling of all of these units (Intel and AMD architecture and engineering briefs) up to big blobby fuzzy pictures like I drew above (and often in color!). The main thing for understanding hyperthreading is to at least grasp the basics of what is outlined above. 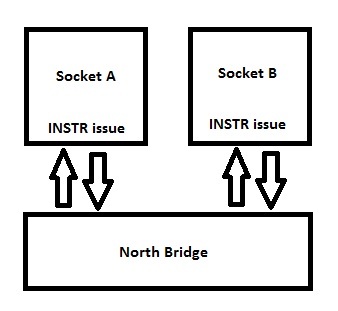 In a hyperthreading enabled processor, for each physical CPU (be they cores within a multi-core CPU, or individual CPUs in a multi-socket system), two logical processors are presented to the Operating System. As you can seen above, each logical CPU effectively has an issue. What this really means is that a single CPU core is armed with two issues (in comparison to the prior diagrams where each physical CPU/core had a single issue). And so this is why I feel it is very important to use the terminology logical CPU only in the context of something like hyperthreading. So far we haven’t discussed virtualization at all; and with good reason! The above is already pretty complex, but we are about to complicate matters further! In a virtualization system, what is essentially happening (and this is true regardless of whether it is client virtualization with a full host OS, slim hypervisor with a parent partition, or monolithic hypervisor like ESX/ESXi) is that a piece of software called a “virtual machine monitor”, in concert with hardware support these days (AMD-V, Intel VT) presents to a “guest” operating system what appears to be physical hardware to that guest operating system but what is, in fact, a software simulation. The virtual machine monitor is a kind of multiplexer brokers access to physical resources from multiple clients. The physical resources are allocated into pools that are then virtualized. Physical resources are obviously finite, so some very careful scheduling and resource management is done by the virtual machine monitor in order for it to be effective (this is the “secret sauce” in virtualization). The two most important physical resources that must be monitored closely are processor time and RAM. Storage, network access and IO are also absolutely vital, but are a bit out of scope for this entry. RAM is as well, so let’s focus on processor time. I have included clock speed in this diagram for a very specific reason. Considering the above, we can see that we have two physical 3Ghz processors (whether this is two single core CPUs or a single dual core doesn’t matter at this point). This gives us a total, physical, processing capacity of 6Ghz. It is important to view things this way because it is how the virtual machine monitor views them. 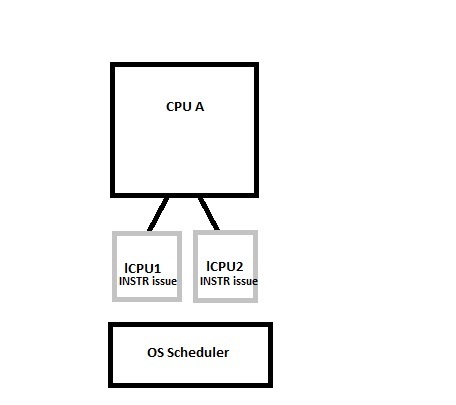 The virtual machine monitor will represent that physical processing capacity to its guest operating system as some number of virtual CPUs which, at their essence, are scheduling time within the virtual machine monitor – virtual cycles which will then be mapped to a physical CPU schedule maintained by the virtual machine monitor. VMware presents some really broad guidelines on vCPUs. On the one hand, you can create a maximum of 512, on the other hand, the recommended guidance is to not create too much more than 4 “per core” (or physical CPU) “based on workload”. At first pass, this seems overly broad, but there is good reason for it. If you can consider this in terms of processor time sharing rather than hard line mappings it becomes a lot more clear. In the example above, we have chose to configure a total of 4 vCPUs in front of those two physical CPUs. What this means is that if each vCPU is running at 100% utilization, 100% of the time, it can effectively be the equivalent of a 1.5Ghz CPU. The reason for this is that the two physical CPUs have 6Ghz of processing capacity in aggregate. Realistically, however, it is very unlikely that any workload will be at 100% utilization 100% of the time. What is the processor utilization trend of a DNS server, for example? A DNS server might actually be able to get by just fine with a 200Mhz “CPU” with occasional spikes for zone transfers, boot storms, etc. What this all boils down to is that planning “number of vCPUs to physical cores”, is really an exercise in deep resource utilization analysis on the projected workloads. This is often data that is absent when coming from a physical infrastructure where even heavily under utilizing workloads still consume a full physical server, but it is vital to ensuring that resources are being consumed in the most efficient manner which is the core value proposition of virtualization. 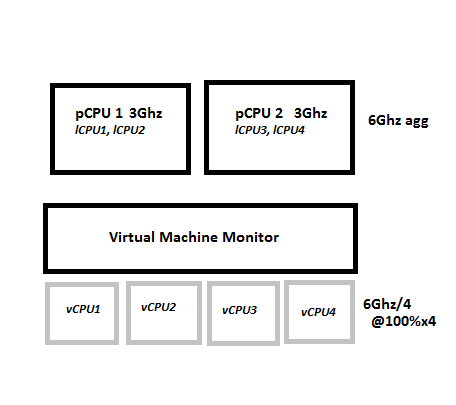 Virtual GPUs, Monolithic Hypervisors, Slim Hypervisors, Oh my! Great post – thanks Mark. I really struggle to explain this to customers, so it is really helpful for me. When designing virtualized architectures for Exchange hosting, I have to keep reminding customers that mailbox servers really do run at consistently high CPU utilization (in an environment where we are placing as many mailboxes per server as possible). They seem to think that they can put 4 mailbox VM’s on a single physical server and somehow get the same performance as 4 physical servers…. Great point. I am doing some Exchange virtualization work in a multi tenant environment now and it is challenging – esp when having to deal with E2k, 7 and 10 at once. The architecture has changed a ton over time! It’s interesting that both ends of the bad assumption spectrum are common. I’ve seen the same you have, and also the opposite where a customer is reluctant to put more than a few commodity core infra servers on a nehalem core! You had me until you petered out in the last paragraph. It seems we need a methodology. I am working on an approach but it’s at the aggregate level and to get down to something statistically accurate there is a lot of data gathering and data entry required.